These are the straps I designed for the secret hex bag. Below are charts, written instructions, and a video. Plus a bonus alternate two-row version. Yay! My suggestion is that you look at the chart, watch the video, and go for it. If you absolutely must, read the written directions, but they are super-wordy even though the straps are pretty simple to make. 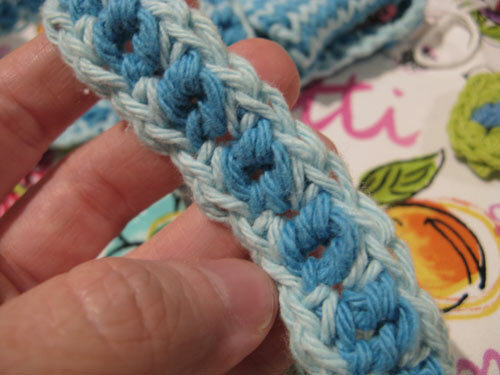 Row 1: Make an odd number of foundation single crochet (fsc) stitches. Stop making that face ... it's easy! If you don't believe me, click through to my tutorial and read all the comments that say how happy everyone is that they finally learned to do fsc. You can do it. Trust me!!! My tutorial has a video and step-by-step photos. And, you can ALWAYS email me. I bet you'll have it mastered in 10 minutes, tops. Row 2: Make two single crochet (sc) stitches in the top of the third fsc, chain 1, * skip 1 fsc, 2 sc in next fsc , chain 1 repeat from * until you get to the last fsc. 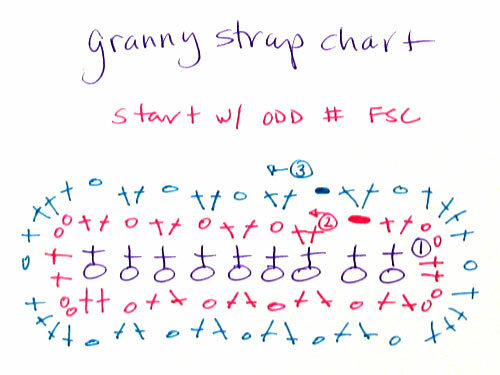 In the last fsc make 2 sc (in the top of the fsc), chain 2, 2 sc (in the side/end of the fsc), chain 2, 2 sc (in the bottom of the fsc making sure to catch center bar of fsc so there is no yarn between the 2 sc in the top of the fsc and the 2 sc in the bottom of the fsc), chain 1. Along the bottom of the fsc row * skip 1 fsc, 2 sc in next fsc , chain 1 repeat from * until you get to the last fsc. In the last fsc make 2 sc, chain 2, 2 sc, chain 2, 2 sc, chain 1. 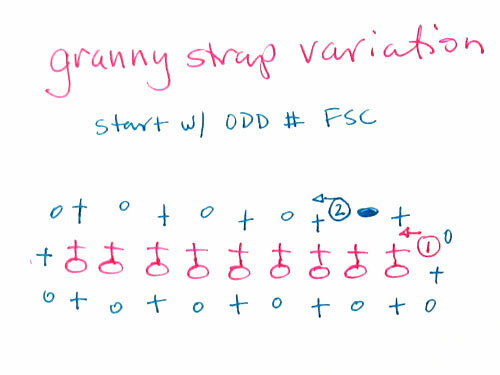 Skip an fsc, 2sc in next fsc, slip stitch to top of first sc of Row 2, pull a loop through the last stitch, cut yarn and pull end through, and tie a square knot on the back of the strap with the beginning and ending yarn ends. Row 3: In the chain space to the left of the start of row 2, make 2 sc, chain 1, * skip 1 fsc, 2 sc in next fsc , chain 1 repeat from * until you get to the 2 chain corner. In the 2 chain corner make 4 sc, chain 1, in the next 2 chain corner, make 4 sc, chain 1. Along the bottom edge * skip 1 fsc, 2 sc in next fsc , chain 1 repeat from * until you get to the 2 chain corner. In the 2 chain corner make 4 sc, chain 1, in the next 2 chain corner, make 4 sc, chain 1. Make 2 sc over the slip stitch that completed Row2 trying to hide the knot, if you can, slip stitch to top of first sc of Row 3, pull a loop through the last stitch, cut yarn and pull end through, and tie a square knot on the back of the strap with the beginning and ending yarn ends. Finishing: Weave in yarn ends. 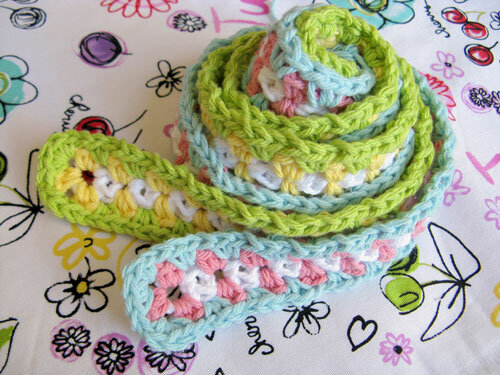 Here is a two-row version I used on the phone cozy I made. Row 2: Start with top of third fsc, make one *single crochet, chain one, skip an fsc, repeat from * until you get to then last fsc. In the last fsc, sc, chain 1, sc, chain 1, 1 sc to work around the end of the fsc row. Along the bottom of the sc (be sure to catch the center piece of yarn) chain 1, skip one fsc, *single crochet, chain one, skip an fsc, repeat from * until you get to then last fsc. In the last fsc, sc, chain 1, sc, chain 1, 1 sc to work around the end of the fsc row. Slip stitch to the first sc. Let me know if you have any questions or anything is confusing.